Unique design can be used as cabinets or enclosed locking storage. Ideal for libraries, breakrooms and conference rooms. 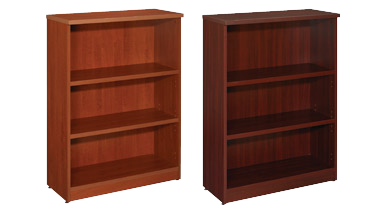 Features commercial grade 1" thick shelves. Resists water, scratches and dents with a PVC protective edging. 3 shelves (1 adjustable). 32"W x 14"D x 44"H. Henna Cherry finish. Ready to assemble.